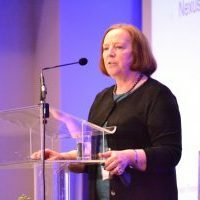 Dr. Anita Nilsson started her nuclear career in the Swedish Government structure at the Delegation for Atomic Energy, which later became the Swedish Nuclear Power Inspectorate where she held leadership positions with responsibilities for non-proliferation, international and national safeguards, bilateral nuclear cooperation and export control. She was in charge of the Swedish programme for nuclear security support to the Newly Independent States and the Baltic States and Coordinator of the Swedish Support Programme to the IAEA. She joined the International Atomic Energy Agency in 1996 as the Senior Co-ordinator of the Department of Safeguards, where she developed the information review process for international safeguards. In 2002, Dr. Nilsson was appointed as Director of the Office of Nuclear Security, responsible for developing and implementing the IAEA´s nuclear security programme. Since leaving the IAEA in 2011, she leads an international network of experts for worldwide nuclear security implementation, anchored in AN & Associates. Dr. Nilsson is a Master of Science and Doctor of Medicine. She serves as associate fellow at Chatham House, advisor to the Federation of American Scientists and is a Member of the Board of Directors at ISEC Industrial Security.